You know when you’re all, like, ‘Man, I wish someone would go ahead and invent X already’, and then lo and behold, that very same day someone goes and alerts you to X, and you’re all, like, ‘Woah! That’s awesome!’. That’s what’s happened to me today. Sitting on the bus I was thinking that it would be great if I could read books on my iPhone, rather than having to occupy myself by cursing the fact that I’d just left a massive Amazon delivery unopened on my kitchen table. And today, Google announces that they’ve made 1.5 million of the books they’ve scanned and uploaded available for mobile devices. All you need to do is visit http://books.google.com/ from your iPhone or G1 device, and then kick back and get your dose of the Classics. They’ve all been optimised for mobile, so there’s text instead of image files. 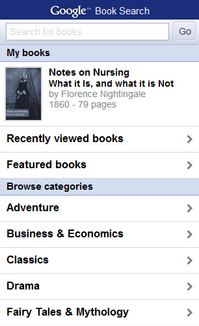 I’m starting with Florence Nightingale’s ‘Nursing: what it is and what it is not’.